Toe Nail trimming need not be stressful or time consuming. 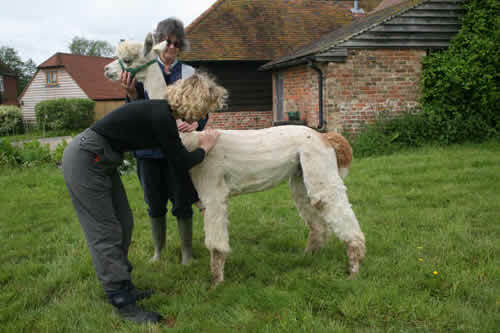 Training an alpaca to accept having its feet picked up and toes trimmed, is better from an early age. For the sake of this example we have chosen a fully grown adult male (Charlie Brown) who has learned through our handling techniques that toenail trimming is not an ordeal (by the way, he doesn’t always behave!) 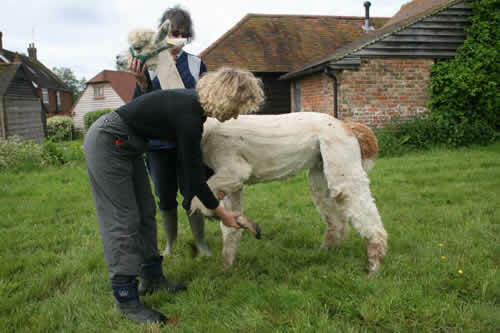 Although toenail trimming is a routine element of alpaca husbandry, we would suggest attending a husbandry day here – before attempting this yourself. This is to ensure that new alpaca owners understand the correct techniques and don’t inadvertantly cause distress to an alpaca. It is far easier to do this with a handler as well as someone to trim the toenails. Your alpaca should be standing in a well balanced manner – bearing the same amount of weight on each foot. 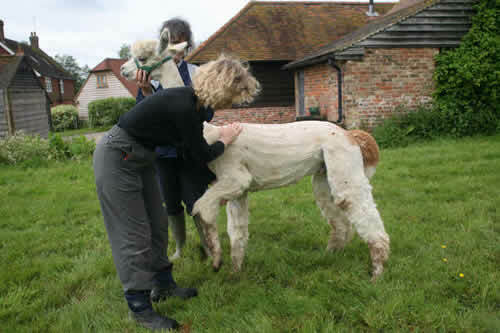 Alpacas don’t (as a rule) like having their feet “grabbed”, so it is better to work down the front legs, then along the back and down the back legs. Not every alpaca will feel relaxed during this process, but if you always follow the same procedure, then it should become easier over time. Your outside hand should be on the shoulder – your inside hand should firmly, but as slowly as necessary, move down the inside of the leg to just above the knee. 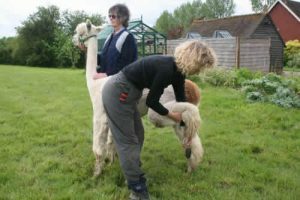 Your outside hand (on the shoulder) should gently push your alpaca’s weight onto the other front leg – and while doing so, ease the leg forward so that it bends at the knee, and the foot comes off the ground. While continuing to support the alpacas leg above the knee, the other hand gently takes hold of the leg at the fetlock joint. 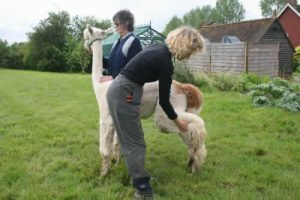 As I am right handed, I now pass the leg from my right to my left hand so that I am now holding the alpaca’s foot whilst continuing to support his weight. I am now in a position to trim the toenails. Your hand nearest the alpaca should rest on its back. While supporting with this hand, your right hand should move slowly but firmly down the leg until it is just above the front of the hock. 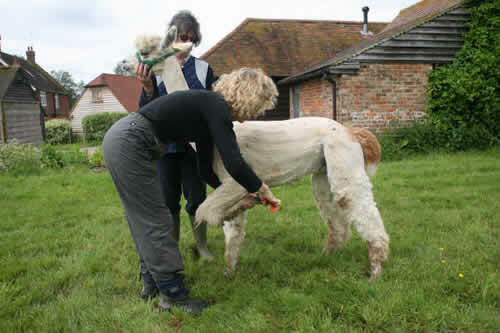 The hand on the alpaca’s back should gently push the alpaca’s weight onto the other foot, while lifting the hind leg up as stated, just above the front of the hock. Whilst supporting the hind leg with the right hand, the left hand should move down towards the fetlock and foot and gently flex the foot so that the toenails can be trimmed. By now holding the foot in your left hand, you can pick up the toenail trimmers and trim the toenails. Toe trimming – but please don’t try this without first having a demonstration from someone who knows what they are doing. Overgrown toenails can be very problematic, and are best left to an expert or vet.